Picaso did art. Steve Jobs did computers. Mozart did music. Dr. Jack Turbyfill does dentures. 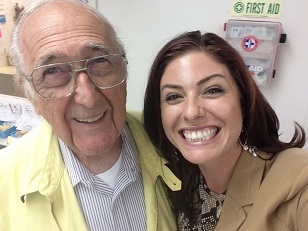 I spent the weekend in Virginia learning from one of the “greats” of dentistry- Dr. Jack Turbyfill. I learned about the Turbyfill denture technique straight from the man himself. The course was three days of lecture combined with watching Dr. Turbyfill work on a live patient. The technique involves a functional impression, a very accurate bite, and a treatment denture. While a typical impression takes about three minutes to set in your mouth, a functional impression slowly molds to your tissues and muscles as you speak, chew, and smile. This helps eliminate areas in your false teeth that would cause sore spots. A treatment denture or “training wheels” is worn for several months to work out the details (sore spots, esthetics, phonetics, occlusion) before the final denture is fabricated. One of the coolest parts about these dentures is that porcelain teeth can be used to maximize esthetics and ensure that vertical dimension isn’t lost with tooth wear.